In her former home, the mother of sensual designs, Ilse Crawford, had a separate bath and shower/steam room, and his and her sinks. I really like the handmade tiles, the wooden floor and the concealed mirrors above sinks for privacy. Wherever I travel, I rarely run into a shower that is more comfortable to use than the one I have at home. The gratitude I feel towards my bathroom is enormous. It has to do with many things: the general high quality of plumbing in Finland, the amazing quality of tap water in Helsinki, as well as how our bathroom is designed and built. What I would like to amplify in this clean, comfortable and well-functioning space we have though, is the sensuality factor. Bathing is such a bliss. But somehow in the culture that prizes functionality and effectiveness over any “softer” value, bathrooms are designed around the thought of hygiene, not pleasure. Clean and decent, they are these neutral spaces where you perform the inevitable personal care to keep yourself looking, smelling and feeling somewhat civilized. 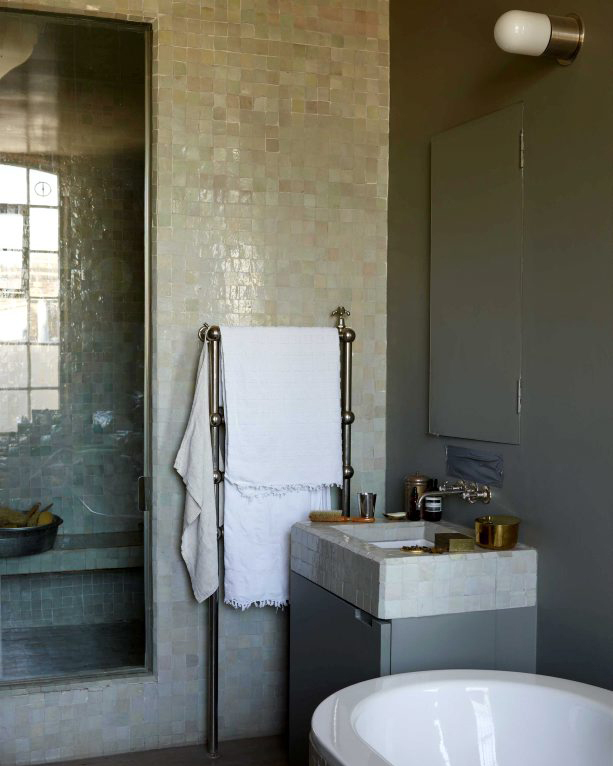 Man-made massproduced materials is what we often go for when fitting in a bathroom, although there would be so many more tactile and sense-evoking choices such as wood, soft-textured stone or handmade ceramics. Instead of cleansing products or synthetic air fresheners, bathrooms could smell like fresh flowers, or your favorite essential oil blend, or fresh eucalyptus that opens up brilliantly in the steam. Layered lighting. Task light is crucial, but lower lever mood lighting does wonders to the atmosphere. So do candles. Something to sit on. A bench or stool in the shower may make you linger for a little longer, and why wouldn’t you, every now and then. Less products, but better. I really like the 500 ml hair and body products from Aesop that both family and guests can use. Something nice to step on, when getting out of bath or shower. A weighty and highly water absorbent cotton terry mat is my favorite. I found mine at Lane Crawford in Hong Kong.